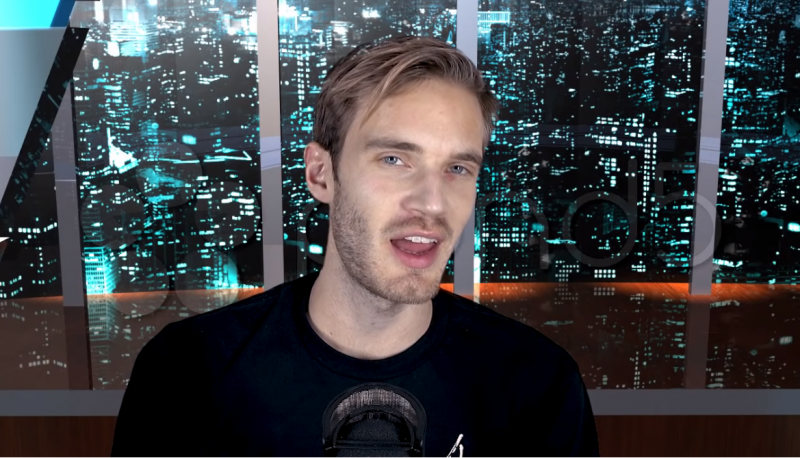 Felix Kjellberg, a Swedish YouTube personality best known online by his account name “PewDiePie,” promoted, in one of his video offerings, another YouTube account that has posted white nationalist and anti-Semitic content. 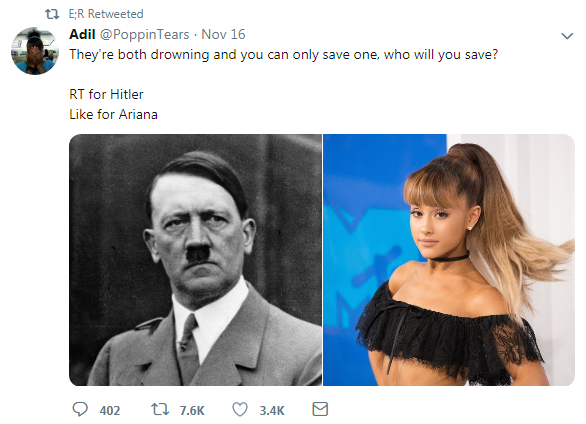 At the time of this article, Kjellberg has more than 75 million subscribers on YouTube, making his channel the most popular on the gargantuan video platform, and broadcasts to an audience that skews younger in age. Right Wing Watch reached out to Kjellberg via email but has not received a response. At the end of a video published on December 9, Kjellberg included a YouTube channel operating under the name “E;R” in his list of recommended channels. The shout-out was noticed by members of the progressive YouTube community, who sounded an alarm. “We also have E;R, who does great video essays about—he did one on Death Note, which I really, really enjoyed,” Kjellberg said. 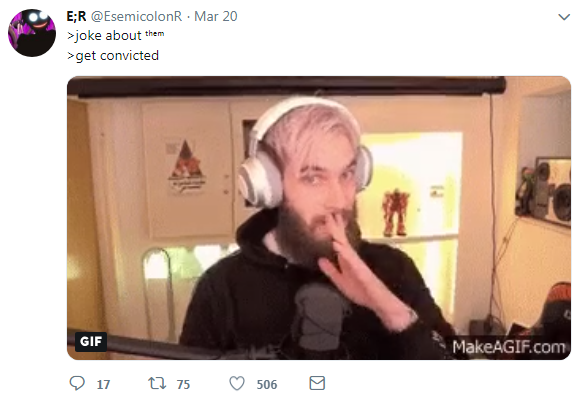 He also linked to the E;R channel in the video description, which has received 15,000 additional subscribers and more than 70,000 new video views since Kjellberg’s plug. In the same video, the user jokes about the murder of Heather Heyer, who died after a neo-Nazi protester at the Unite the Right white supremacist gathering in Charlottesville, Virginia, in 2017, plowed his car into a group of protesters, reiterating the white nationalist myth that Heyer actually died of a heart attack. 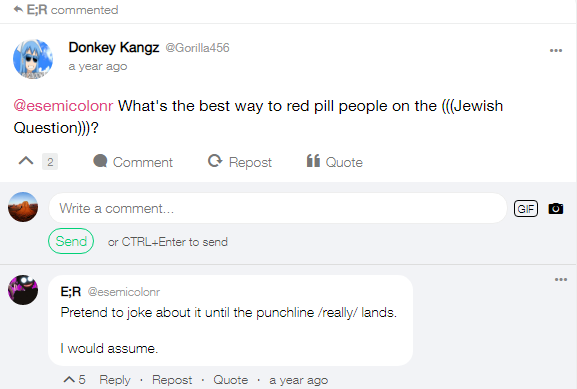 On their YouTube channel, the user posting as E;R has uploaded anti-Semitic content, and on Gab the user has openly discussed the “Jewish Question” conspiracy theory popular in white nationalist circles. In January, the user bragged about seeing footage from one of their videos in a Kjellberg post. In one video, uploaded June 11, 2016, cartoon footage from the Cartoon Network show Steven Universe precedes a slideshow of various social media and corporate media company executives believed to be Jewish and the anti-Semitic “echoes” meme popularized by white nationalist media personalities. 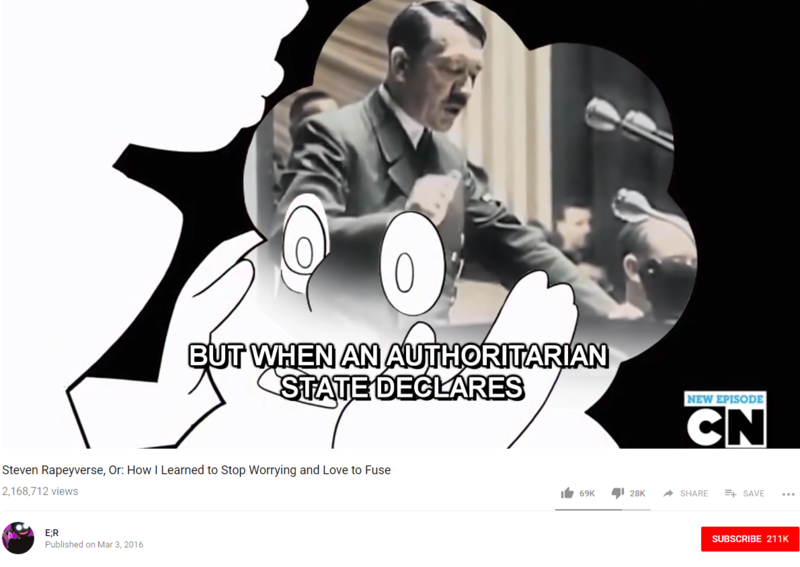 The video ends with a play on the white supremacist “14 Words” slogan, reading “We must secure our existence and a future for human children.” The channel also features a video from March 3, 2016, that contains uninterrupted footage of an Adolf Hitler speech overlaid with anti-Semitic cartoons. On Twitter, the “E;R” account has posted referring to Jews as “them”—common usage in white nationalist circles—and re-posted jokes about Hitler. “Do you not find an issue with that? Do you not think that’s insanely irresponsible?” Piker said.